Like the trams and trains produced by Siemens, manufacturing is still part of Vienna. Glowing sparks arc through the air as massive cranes transport steel structures while loud booms thunder through the assembly hall. 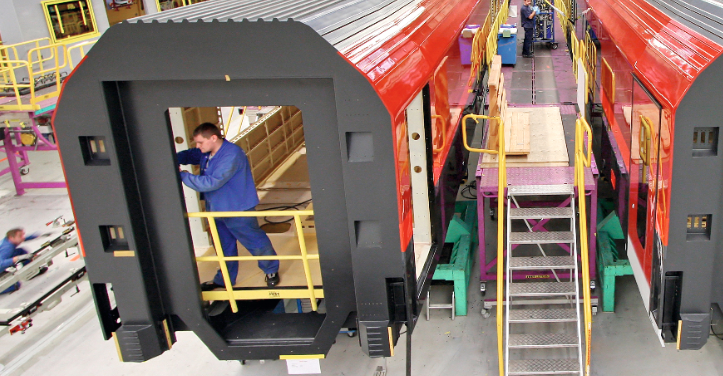 At Siemens’ Mobility Division plant, whole fleets of subway cars are built, giving jobs to 1,300 workers. Special rules apply on the factory floor: Street shoes must be replaced by heavy safety shoes, and pedestrians have to make way for the numerous forklifts. At 140,000 square meters, the plant is almost a city in itself; but unlike similar facilities, it’s not hidden away on the periphery – instead, it’s smack in the middle of Vienna. About 180 years ago, Siemens, Europe’s largest industrial manufacturer, opened its Simmering plant at Leberstraße 34. Today, it is a symbol that heavy industry still has a place in Vienna. Viennese industry is booming, explains Stefan Ehrlich-Adam, industrial spokesman for the Wiener Wirtschaftskammer (Vienna Economic Chamber), with companies like Opel, Bombardier, Manner, Henkel, Ankerbrot, Baxter, Böhringer and Wiesbauer manufacturing within city limits. “In the past two years alone, €1 billion has been invested,” he says, mostly in upgrading environmental technology and energy efficiency as well as modernizing machinery. But despite the influx of cash, more and more companies are leaving. 17 percent of Vienna’s industry has left in the last few years, with another 10 percent planning to leave in the foreseeable future. Citing high costs, lack of space for expansion and problems with neighbors, most choose to relocate to neighboring Lower Austria. “International companies come to Vienna, but no industrial production,” says Ehrlich-Adam. It wasn’t always like this. At the onset of industrialization around 1800, Vienna lagged behind, with Emperor Franz I eager to keep factories – and labor unrest – away from his residence. But once railway construction began in earnest in the late 1820s, there was no going back. Locomotive and boxcar factories like the Siemens plant were constructed to help modernize the empire, with residential quarters for the workers added in the outer districts. From the 1880s, electrical engineering was a major sector, followed by a boom in the automotive industry around 1900. The wartime and interwar years meant the metal, machinery and electrical industries were running at peak capacity, with radio production joining from the 1930s onward. However, after the Second World War, Viennese industry soon came under pressure, with numerous plants closing due to increasing international competition from the 1960s onward. Above all, the state-owned Austrian Federal Railways (ÖBB) and the city’s transit authority, the Wiener Linien, appreciate the proximity of the plant, which not only builds vehicles, but also maintains and upgrades them. Currently, all of Vienna’s tramways are having their rearview mirrors replaced by cameras: One after another they’re brought into the Simmering plant via direct rail connection, refitted by Siemens staff and then fed back into the Wiener Linien network. There is a similar link for the ÖBB railway. “That is of course optimal for the customer. It saves time and transport costs,” says Strasser. Still, competition is fierce. 70 percent of rail vehicles worldwide are produced in China, with the remainder divided among several European companies. In order to remain competitive, Siemens will consolidate next year by merging with the French group Alstom. “That puts us at 15 percent and we can be a bit of a counterweight,” explains Schwendemann. But it is becoming increasingly difficult to find suitable staff, with engineers, mechanics and technicians in short supply. “A welder who is certificated for railway car bodies is rare,” Schwendemann remarks. As a result, Siemens recruits heavily abroad, particularly from Czechia, Slovakia and Romania. The company helps newcomers integrate, providing German courses and kindergarten spots. To keep their edge, new technologies are tested and developed. Currently, the big topics are driverless subways and buses. “Our development teams work closely with the Wiener Linien,” says Strasser. The U5, currently under construction, will operate without drivers in the future, while driverless buses are already being tested at Seestadt. In addition, Siemens is increasingly focusing on automation. Schwendemann points to laser measuring equipment, robot-controlled paint systems and air cushions that transport wagons through the hall. “Long welds are made by robot,” he explains. “Only detail work is done by hand.” It’s demanding work. “When welding, you have to be careful that the material does not distort or expand,” says Schwendemann. The quality is appreciated abroad. Currently, the spacious assembly halls are building subways for Nuremberg, Bangkok, The Hague and Riyadh.